Box Text: At last! You can play the first Official ADVANCED DUNGEONS & DRAGONS action game made for the Ninendo Entertainment System! 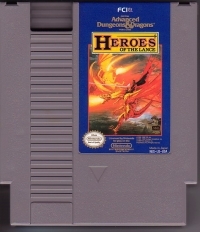 HEROES OF THE LANCE is based on the Dragons of Despair DRAGONLANCE module, placing you in control of eight fantasy characters. Guide your brave companions through their adventures as they encounter dragons and swarves...magic monsters, in their quest for the precious Disks of Mishakal. The fate of the world of Krynn is in your hands! Vanquish the ancient black dragon Khisanth or you are doomed to failure! 11-17-2012 exonerator Box Text At last! You can play the first Official ADVANCED DUNGEONS & DRAGONS action game made for the Ninendo Entertainment System! 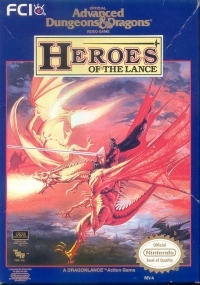 HEROES OF THE LANCE is based on the Dragons of Despair DRAGONLANCE module, placing you in control of eight fantasy characters. Guide your brave companions through their adventures as they encounter dragons and swarves...magic monsters, in their quest for the precious Disks of Mishakal. The fate of the world of Krynn is in your hands! Vanquish the ancient black dragon Khisanth or you are doomed to failure! 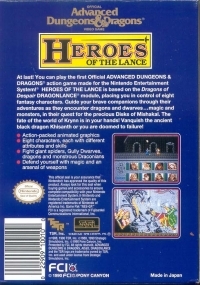 This is a list of VGCollect users who have Advanced Dungeons & Dragons: Heroes of the Lance in their Collection. This is a list of VGCollect users who have Advanced Dungeons & Dragons: Heroes of the Lance in their Sell List. This is a list of VGCollect users who have Advanced Dungeons & Dragons: Heroes of the Lance in their Wish List.